It is important you know your rights – and duties. For this you need to be informed about the laws and regulations in place and what the Government has pledged to do to fight corruption. You have the right not to be a victim of corruption. And you have the duty to not engage in it. Everyone has the same right to access public services and be served fairly, without being discriminated against. Someone who bribes a public official should not be served before you and should not receive faster/ better quality services than you. Corruption is a criminal offense that carries penalties widely elaborated upon in the 2010 Anti-Corruption Law as well as in the Penal Code. Being part of an informed citizenry is vital to a healthy democracy: it holds elected officials responsible for their actions. Corruption is defined by TI as the abuse of entrusted power for private gain. It can take many different forms, from bribes and fraud to embezzlement, nepotism, conflict of interest and collusion. Bribes are the most common and most visible form of corruption. It’s what you, as an ordinary citizen, may encounter the most. When you are stopped by the police, when you go to the hospital or when you try to obtain a permit or official document, it is important that you know what the official fees or fines are. “Unofficial payments”, or “facilitation payments” that you may be required to pay are a mere euphesim for bribery. A list of official fees will soon be published by the Ministry of Finance. We will keep you posted and make sure that it is disseminated to as many people as possible. It is not always easy, but when asked to pay or accept bribes, facilitation fees or gifts, you can refuse. By saying NO you not only stand against the corrupt, you also stand up for your community. That being said, in a country where corruption has been pervasive for so long like Cambodia, saying NO is not easy and can lead to difficult situations – such as being declined healthcare or being refused a job. However don’t forget than when saying NO to corruption you are only obeying the law and that if citizens start to say NO more often, attitudes will change and the situation will improve. Bribespot is a website and mobile app that allows you to flag your encounters with corrupt officials. It’s completely anonymous and safe. 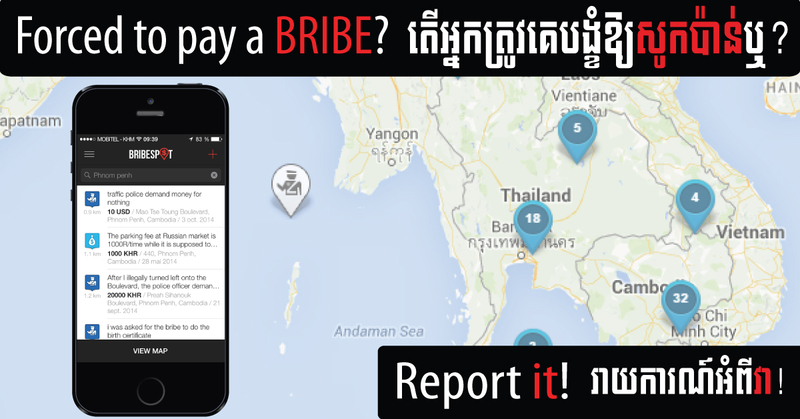 If you are asked and/or forced to pay a bribe, simply open the app and pinpoint where the incident occured on the map that displays automatically. Specify how much money was involved, what type of public official you were dealing with and provide a short summary of the incident. Do not use names: Bribespot’s intention is not to point fingers at individuals but rather to have an idea of where the big corruption hotspots are and provide a platform where citizens can discuss incidents of corruption and advise each as to how to deal with it. You can go further and seek legal advice if you want to file an official complaint. 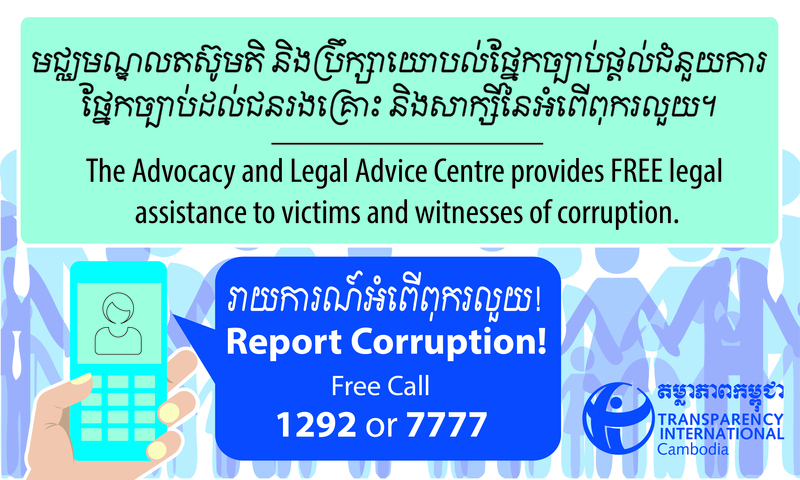 Transparency International Cambodia has an Advocacy and Legal Advice Centre (ALAC). You can call our hotline (1292 or 7777) anytime or come physically to our centre to simply report corruption incidents or ask for legal support. Wherever possible, our lawyer will help you carry your corruption-related complaint forward and transfer it to the relevant authorities. 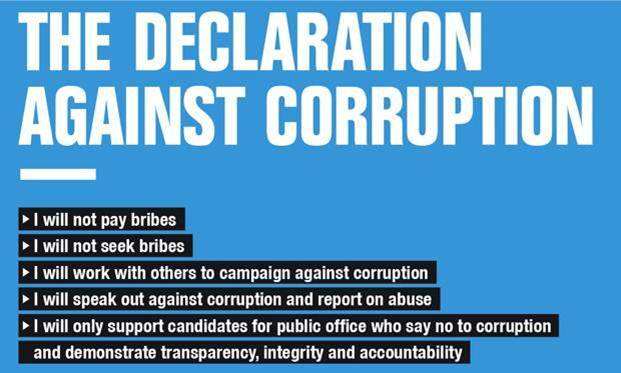 To show your commitment for the fight against corruption, you can join us and sign the Declaration against Corruption and commit, wherever possible, to five simple but meaningful things (see above). You will then get your anti-corruption card. You will receive discounts in a number of shops around Phnom Penh and soon in the provinces who have also showed their commitment and joined the movement! The anti-corruption card will be officially launched on 24 June and we are now working on a platform for you to register easily and be able to browse for partner companies across the country. Stay tuned! Many people around the globe are already making a difference in their communities and countries they live in. You too can take action and mobilise your peers. Kick-start a campaign, run a hackathon, organise an arts contest or monitor local elections – Transparency International produced an anti-corruption kit offering 15 ideas for young activists, with step-by-step guidance on how to turn a plan into action and successful examples from around the world. There are many other ways you can engage with us. TI Cambodia regularly organises competitions, trainings and events. Check out our website to stay informed and engage with us on Facebook, Twitter, Instagram and YouTube!